The Wigan-born back, who has also featured at centre for his country, was part of the victorious British & Irish Lions squad to tour Australia in 2013. 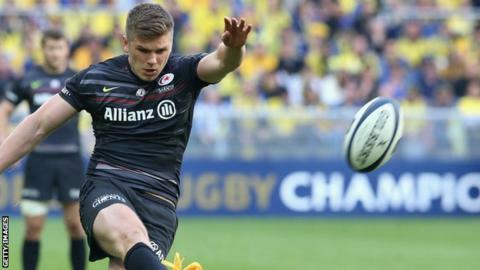 Having suffered a high-grade medial ligament strain in January, Farrell returned to action for the first time in Saracens' European Champions Cup semi-final defeat by Clermont Auvergne on Saturday. "Owen is one of the leading players in Europe, if not the world, so for him to commit his long-term future to the club is fantastic news," said Saracens director of rugby Mark McCall. "He is another player who has progressed through the ranks at Saracens to become a key player for club and country. He is a Saracen through and through, and his hunger and drive to keep on improving is exceptional." His club currently sit second in the Premiership table, eight points behind leaders Northampton Saints, with three regular-season matches still to play.